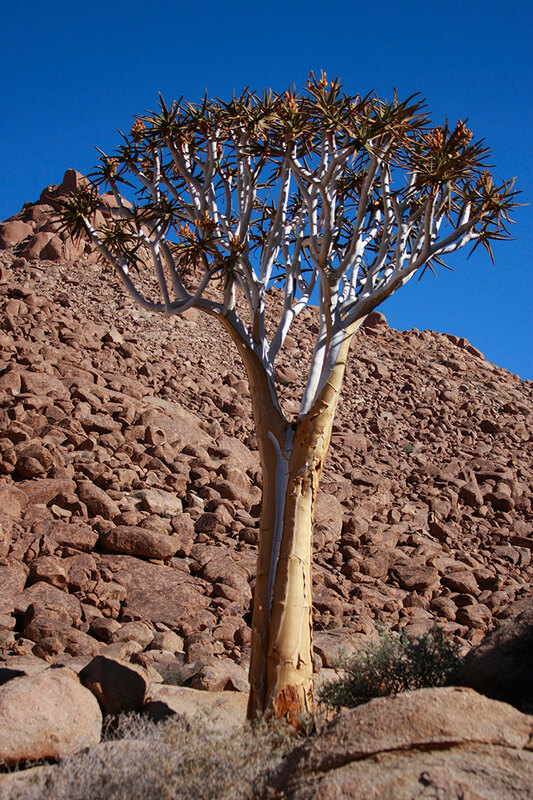 Are you heading to the other-worldly stark desert landscape of the /Ai/Ais- Richtersveld National Park? The vast park has many experiences on offer. Here are a few stops not to be missed. A 4×4 or high-clearance vehicle is essential for travel within the park. Take a slow drive through Halfmens Pass to spot the peculiar-looking halfmens succulents, which are endemic to the area. Folklore has it that these are the frozen forms of the enemies of the Nama people, trapped for eternity in the desert landscape. Sendelingsdrift’s blossoming nursery hosts a number of rare and special plants, many of which are found nowhere else in the world. In this vast desert wilderness, the mighty Orange River rolling by will refresh the soul. There are many spots to choose from: sit on the grass at Sendelingsdrift, pop in at De Hoop, or enjoy the silence of the river at Richtersberg or Tatasberg. If you’re a fisherman, enquire at reception about a permit. Rock engravings on black dolomite rocks are littered around the park. But a few clear examples of these centuries-old San petroglyphs can be seen just outside Sendelingsdrif alongside the river. Head to the reception deck and bring a bottle of bubbly. 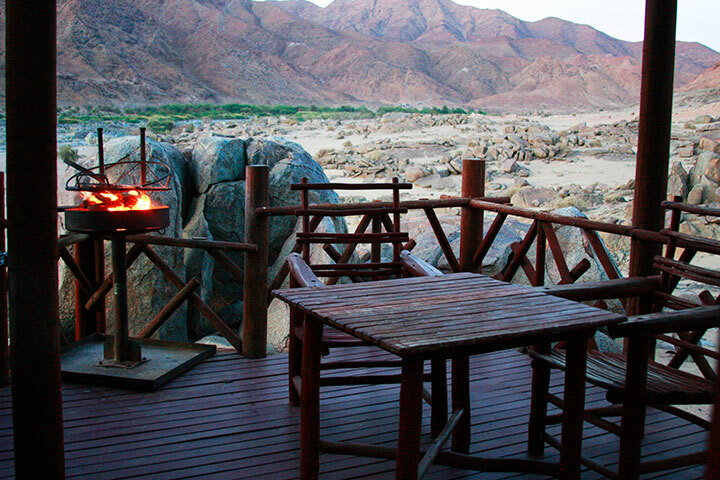 Sip and sigh as you watch the sun set over the mountains of Namibia the other side of the river. 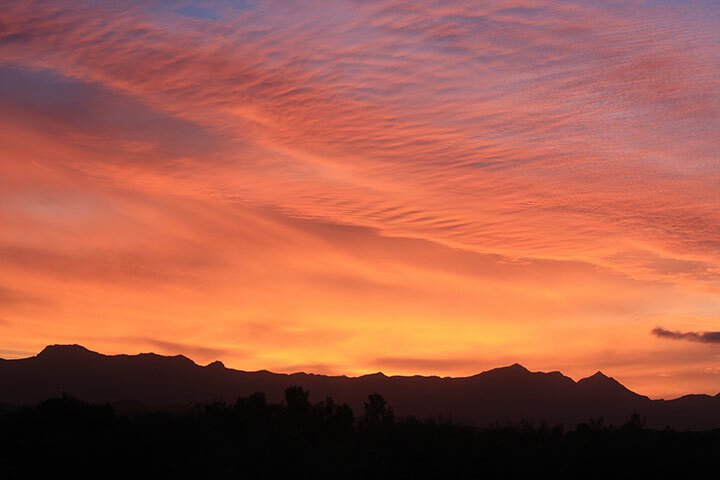 Locals believe that God pressed a hand down on the rockface of the Richtersveld, leaving a large handprint on the mountains. Head just 14kms down the road from Sendelingsdrift and you’ll find this peculiar sighting right next to the road. For a secluded and romantic experience, nothing comes close to Tatasberg Wilderness Camp. 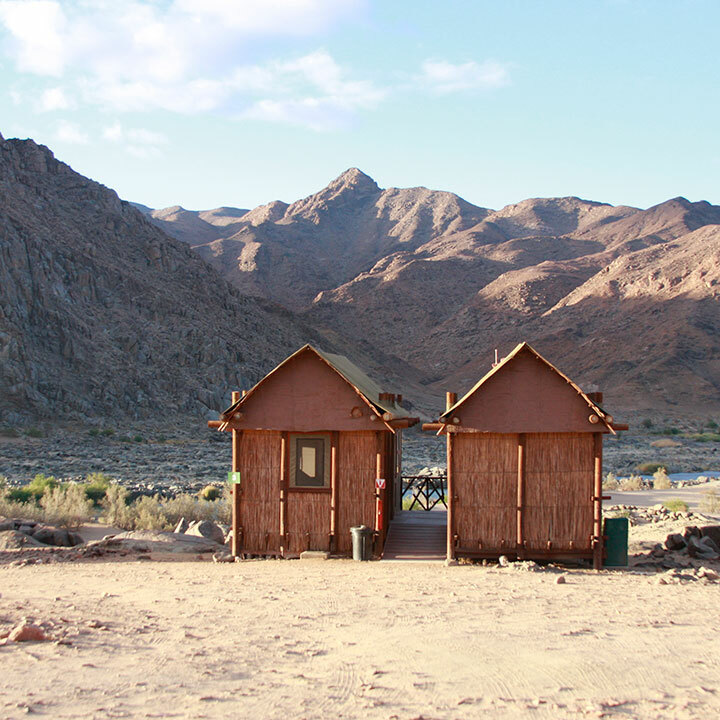 The sounds of silence are tangible at these rustic chalets perched above the Orange River. The Tatasberg makes for an eerie landscape where entire mountains seem to be stacked out of large granite boulders. Search for the genets that live on the surrounding hills, and watch as goats head along their grazing routes in the early mornings. Sendelingsdrift also serves as a border post for crossing into Namibia. From here, it is only a one-minute ride on the pontoon that ferries cars back and forth across the river border to get into Namibia. Gliding across the water with car in tow in no-man’s land is a moment not to be missed. For the brave, the four-day Venstervalle trail that starts at Hakiesdoring Trail Camp explores vast quartzite gorges, masses of botterboom , the crags of the Tswaies mountains and the fountains of Armanshoek. The towering quiver trees that jut out into the sky amidst stark landscapes are captivating sights for most visitors. Some in the park are up to 400 years old, and may even reach 9m high. You’d be remiss to leave without a souvenir – a photo is the only one we recommend.